Dave Sim Cerebus #36 Page 1 Original Art (Aardvark-Vanaheim, 1982). Jaka greets Cerebus in the greenhouse in this spectacular title splash page from the landmark "High Society" story arc. Detailing Cerebus' attempts to become Prime Minister of the city-state of Iest, "High Society" is considered to be a turning point in the book's history, with Sim developing beyond the Conan spoofs of the early issue and developing a sharper, more political form of satire. "Cerebus fans had been pleading for the return of Jaka for almost four years," Sim recently related to us. "and had pretty much given up hope of ever seeing her again." 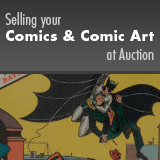 The image area measures 10" x 15" and the art is in Very Good condition. It has been signed by Sim in the lower right corner. From the Dave Sim High Society Collection.